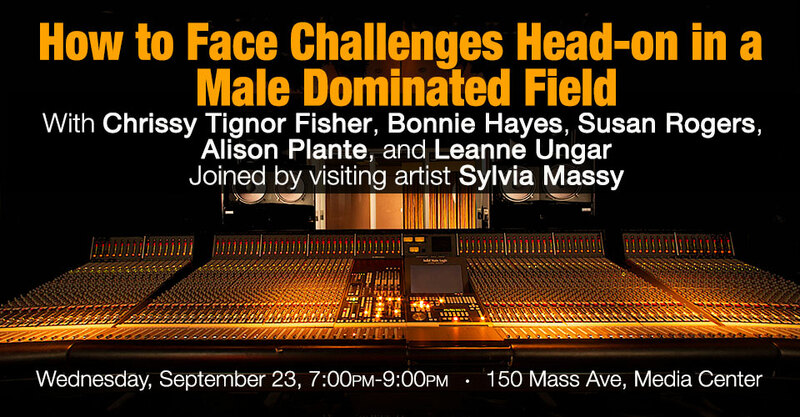 Chrissy Tignor Fisher, Bonnie Hayes, Susan Rogers, Leanne Ungar, and Alison Plante were joined by Sylvia Massy in an open discussion between professionals, faculty, staff, and students regarding challenges faced by women in a male-dominated field. Among the topics covered were what to do in a situation involving sexual harrassment in a professional environment, whether or not women are held to a different standard than men, and how to manage uncomfortable circumstances brought about by being women in a predominantly male field. Students heard stories of facing these very challenges from professionals of the highest calibre, and were able to share stories of their own in order to get advice for what to do should they be in a similar situation in the future. Presented by Women, Technology & Creativity.